Founder David Jaget displays MTBguru’s new moniker on his chest at Sea Otter. 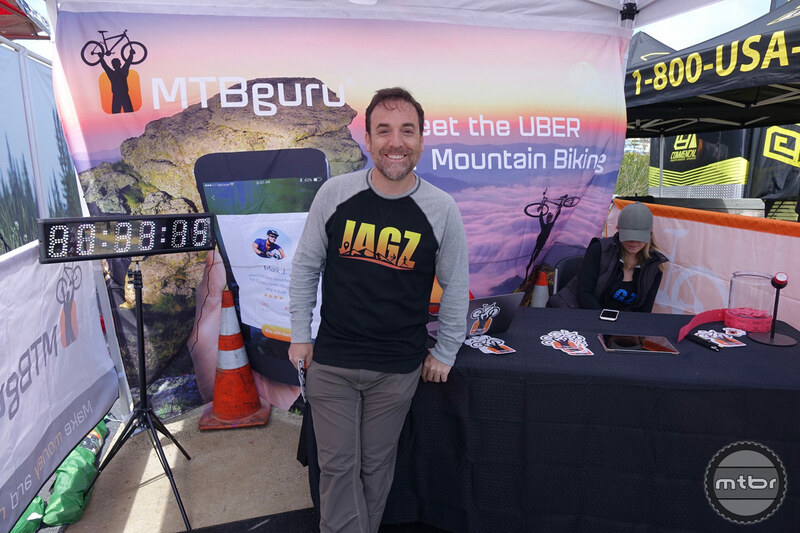 MTBguru, a free social media app aimed at connecting riders with local knowledge and services, is changing its name to JAGZ. “We’re expanding to include road cycling as well, and there’s too many “guru’s” for the term to have any cachet,” explained founder David Jaget, whose nickname supplied the basis for the new moniker. The app has drawn considerable interest from social media users as a Facebook/meet-up work-a-like for hooking up riders passing through a popular destination. Registrants become “gurus” who can provide guidance and company on rides, as well as direct out-of-towners to favorite pubs and lodgings. On the flip side, registrants can contact local gurus when they are traveling. “We’ll have weather, popular routes, and local deals from bike shops and related vendors,” Jaget explained. Participants can use Facebook or their phone number to register. The app, under development for more than a year, is available for download from the Apple store. Besides Facebook, users can register through mtbguru.co. For more information, visit www.mtbguru.co. This article is part of Mtbr’s coverage of the 2018 Sea Otter Classic in Monterey, California. For more from Sea Otter CLICK HERE.